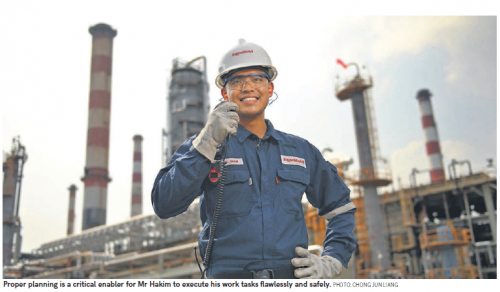 It was not until Mr Abdul Hakim joined ExxonMobil that he realised the importance of stringent safety standards. 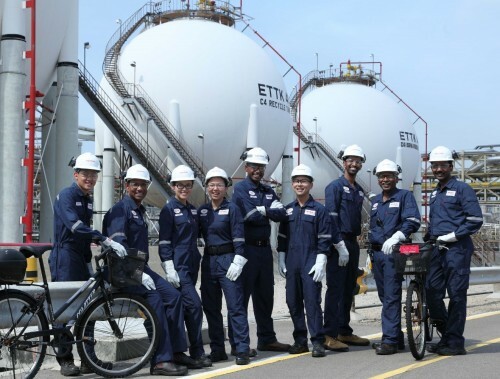 Working as a metals technician at ExxonMobil’s Singapore Refinery, where crude oil is refined into hydrocarbons such as naphtha, gasoline, diesel, asphalt, and liquefied petroleum gas, he has to exercise extreme caution. Mr Hakim reports to a frontline supervisor and planner, and leads a base crew of three pipefitters. Their main duties include carrying out daily maintenance and servicing work on process equipment, such as pipings, vessels, pressure safety valves, pressure and vacuum relief vents, flange inspections, blinding and deblinding, and overseeing lifting operations. Sometimes, they have to work at a height, scaling ladders as tall as a 25-storey building when they attend to reactors, fin fans and exchanges in refinery towers. “Ensuring that every task is executed right the first time without compromising personnel safety is my primary responsibility,” says the 24-year-old, who holds a diploma in mechanical engineering from Singapore Polytechnic. “ExxonMobil ensures that the proper safety equipment, measures and processes are in place for various types of work. We are trained to put safety first in everything we do; we look out for ourselves and also our colleagues,” he adds. 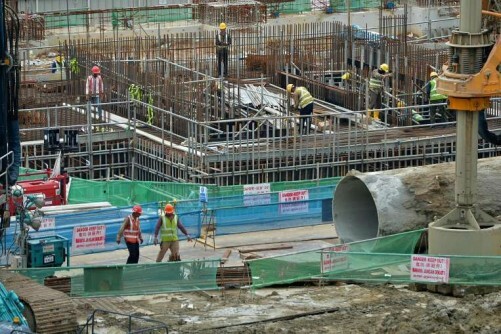 Proper planning is a critical enabler for Mr Hakim and his colleagues to execute tasks flawlessly and safely. “When I am out in the field, a well-planned toolkit and schedule increases my effectiveness in field operations,” he explains. Mr Hakim’s role includes supporting periodic, large-scale maintenance efforts at ExxonMobil’s manufacturing site. He has to change out or replace equipment such as fin fans and exchanger bundles, and remove pressure safety valves for servicing and re-installation. As a metals technician, he also plays an important role as a “flange police”.A flange is a method of connecting pipes, valves, pumps and other equipment to form a piping system. Mr Hakim conducts strict and detailed quality assurance checks on every flange that has been worked on during the large-scale maintenance effort to ensure a safe and leak-free start-up. Even the smallest deviations are rejected, and have to be rectified before the team can move on. “Every piece of equipment is crucial to the success of the refinery’s operations. We cannot afford to let our unit run the risk of tripping. This will slow down production and affect the unit’s reliability,” Mr Hakim says. As a young field technician, he relishes the challenging yet supportive work environment at ExxonMobil. In Singapore, ExxonMobil’s refinery and chemical plant form the company’s largest integrated manufacturing site globally. He says: “Given the large and complex site we have, there is always more to learn to deepen our expertise. It is this environment of constant learning and challenge that I find interesting and fulfilling. “Working here has helped me to surpass my own expectations and grow both as an individual and a professional. ” After more than a year at the company, he has learnt to come up with prompt solutions for problems, and has pushed himself physically and mentally. His communication skills have improved vastly. This is critical, as field technicians rely heavily on good communication flows between the maintenance and the operation teams to execute tasks well. Being able to clearly communicate concerns and issues in a timely manner is also important. Mr Hakim has also made many friends from around the world through work, thanks to ExxonMobil’s international environment. “It is very fulfilling to have such a sense of community with team members of so many nationalities. We are all part of one giant family; we work, learn and grow together,” Mr Hakim says. He hopes to gain more technical knowledge of process equipment and become a safety leader in his field. “Effective safety leaders lead by example, strictly adhering to the company’s safety protocols at all times. There cannot be any short cuts or tolerance for any risk, as other employees and contractors are always watching to see if you walk the talk," he says.